Our chickens and ducks are truly free-range - roaming the pastures during the day, secured in a mobile house at night. We buy all organic feed for our poultry. Their eggs are fabulous. Proud, orange yolks. The best you've had. 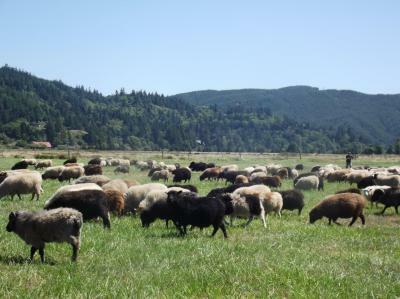 You can buy a lamb or a hoggett (a sheep between one and two years old) and have it processed to your specifications, or you can buy the cuts you want, USDA inspected, at my farm or on Saturdays at the Bandon Farmer's Market. Our beeves are gently and exclusively raised on pasture, with the hay from our fields or other local fields fed during the winter. You don't need to buy a freezer to buy our beef - we take them to an excellent USDA facility and can sell you the cuts you want. Our Icelandic sheep grow luscious fleeces that are a delight to work with. They are a dual-coated sheep; the fiber can be spun as one or separated to get different uses, if spinning. The fiber can also be felted. The sheep come in all colors - white, of course, but also browns, greys, and black. We have a McDermott picker and carder, and will soon be able to make batts or roving from your fiber. We are very selective about which lambs are viable as breeding stock. Contact us with your requirements and we will let you know if we have a match.